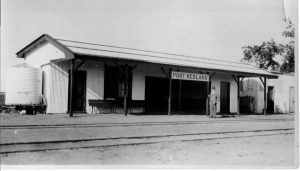 On the vacant land between Moore Street and Wilson Street there once stood the Port Hedland Railway Station. According to local stories the train took residents and workers from Port Hedland to Marble Bar and back by rail on the Spinifex Express route from 1911. The station closed in 1952. The steam train engine G118 was retired to the historic railway station of Kalamunda in the Historic Village complex.